Hugs and Health – the struggle is real! We’ve all heard cute little poems over the years about hugs, what they do, how they make us feel, and that they must be the “reason that God gave us arms”. We know that babies and children thrive and bond through body contact. I watched a program recently where a doctor held a a very sick premature baby all night and her vitals completely improved by morning. I remember a story being told about an orphanage where the night shift cleaning lady would take her break at the end of the row of bassinets, stopping to pick up the baby in the last one for a few minutes of cuddling before continuing on her way: over time it was noticed that babies who spent time in that end bassinet were the first to be adopted because they were the best natured. 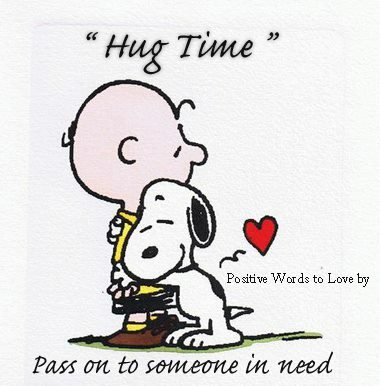 Anyone who has used the internet the past few years has surely seen the sharing of videos showing the dramatic responses when random people somewhere in the world hold up signs offering free hugs. If you do a google search for the effects of hugs on mental health (I could quote articles here, but I will assume you’re capable of searching for yourselves if you don’t believe me!) you will find loads of information about the release of hormones that calm our stress, fears and anxieties, and contribute to our general well being and happiness. You will also find information about the effects of a lack of body contact – touching, hugging – and how the behaviour problems of disturbed children can be changed when given enough hugs. I grew up in a house full of hugs. My mom is famous even in our extended family for her great hugs, and I’ve been told that mine are pretty good. Her whole family hugged. My dad’s side of the family weren’t big huggers, but that seemed to change when my mom came along, or so I’m told! They all hug now. I’ve shared numerous hugs within my own family, and with relatives and close friends. I love hugs. I need hugs. But again, if you do a google search on the topic, you will find that people in other countries are getting hugged far more than we are here, because unfortunately our culture has turned physical contact into something overly sexual with fears and discomfort attached, and many people no longer feel the freedom to just give someone a hug, touch their arm, rub their back or just have body contact in some way. The givers are afraid to be accused and the recipients are afraid it means something more than just a hug. **my perspective here is clearly about normal human contact and not meant to offend anyone who has legitimate reason to be concerned. A few years ago, I had an interesting conversation with a massage therapist working on my back. I was working for a seniors’ outreach program and at the time the Alberta health care program for seniors had just approved coverage for physio therapy treatments. We were discussing the fact that massage therapy treatments were still not being covered and that many seniors, especially those who had lost spouses, no longer received as much body contact as they were used to and that because massage therapy involved a lot of touching and stimulation of healthy hormones, it was an important part of their healthcare. I hadn’t considered it in that way before, but it made a lot of sense. I went back to my office and wrote a letter to advocate for seniors to receive this kind of coverage, giving my perspective based on the mental health benefits in addition to the increased mobility benefits. I didn’t expect to find myself, at my age, in a place where a lack of hugs and body contact would have a negative effect on my well being. I’m not a senior living alone. I didn’t even recognize it right away. But if you think about it, it’s pretty obvious. In general, married couples share a lot of physical contact (in addition to the obvious), sometimes in many little ways without even thinking too much about it as it happens – a short rub on the back in passing, a teasing poke, hand holding, and of course, hugs. It didn’t show itself clearly in the midst of so many other things, but one day it hit me and I realized I was hug deprived! 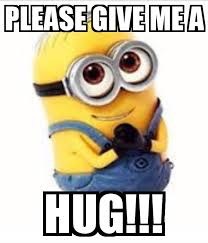 I thought back to my conversation with the massage therapist, about the hormones and the importance of our skin – a living organ – being touched, of body contact with other humans, and it dawned on me that of course I wasn’t getting nearly as many hugs in a day as I was used to getting. It explained the sometimes aching feeling just to be held. Of course there are no hugs like the ones you get from your spouse, but there is much that a good hug can do even if it comes from a mere acquaintance. We NEED human contact and it does affect our mental state. I’m not going to stand on a street corner with a sign, that’s just not me. But if I see one, I will definitely respond now, where I probably wouldn’t have before: that person might simply be offering a gift to others out of love, but they might also be hug deprived themselves and finding a creative solution. My hug circle has grown much wider over the past two years with the situations I’ve been in and the people I’ve encountered, and it’s all been positive. Nonetheless, in the day to day, the lack of hugs really hurts and I never would have known until I felt it myself. Hugs, people! We all need them. 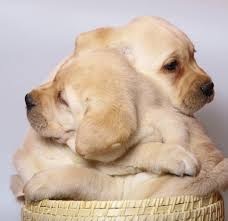 Hug your family, hug your friends, think of people you know who live alone and hug them once in a while too. And if you see me somewhere in public and I look upset, you don’t even have to ask me what’s wrong. Just hug me. It’s easier than explaining, and it’s probably exactly what I need.